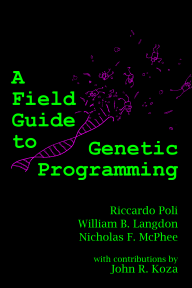 A Field Guide to Genetic Programming: Over 5,000 downloads! Man, I go away for a few days of vacation, and the downloads more than double! We're now at just over 5,000 downloads of the book, and 12 more printed copies were ordered in the last five days as well. Just as I was leaving, Jennifer Willies also posted a ton of good photos from the EvoStar event, including a nice shot of the three Field Guide authors and our cover artist.